"The School for Good and Evil" has been getting a ton of buzz since it came out in 2013. I was excited to finally find the audiobook available on my library's Overdrive page. Every year two children are kidnapped from the village. The children left behind suspect they go to a mysterious school for good and evil, with one child going to each school. Beautiful Sophie and outcast Agatha are this year's chosen. In case you didn't figure it out from the title, the school is real. Yet despite her preparation and planning, Sophie is sent to the school for evil, and Agatha to the school for good. Sophie is certain there must be a mix-up, while Agatha just wants to go home. As the two girls spend time at the school, begin to uncover the truth about why children are chosen from their village and question whether the system is really working. On the whole, I enjoyed the book. But I have to say, after reading others' reviews, I was expecting more upfront female strength and less stereotyping. There's a lot of discussion of the importance of finding one's prince and looking to the boys to save the princess-hopefuls. The ultimate ending does seem to turn this on its head, but not before a chunk of princely heroics that made me question whether I was mis-remembering reviews. I was such a fan of the two main characters subverting female stereotypes, it was disappointing when they were reinforced later. When the story ended, I was left with more confusion than a clear sense of what the message was. Verdict: Jury's out - I enjoyed this enough that I'll read the other two books. Hopefully they'll some prove this series is really committed to portraying strong female friendships beyond a stark good/evil dichotomy. 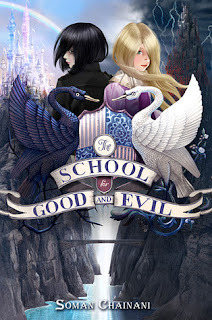 "The School for Good and Evil" by Soman Chainani, published May 14, 2013 by HarperCollins. Audio narration by Polly Lee, published May 14, 2013 by Harper Audio.